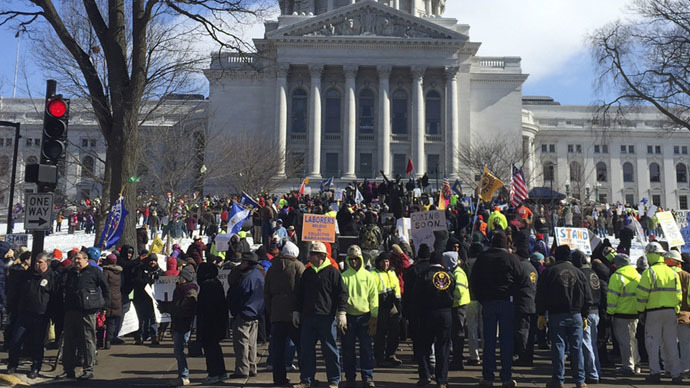 Five-thousand Wisconsin trade unionists braved freezing weather to protest an anti-union law that Republicans are pushing through the state legislature – and to take potshots at Gov. Scott Walker’s comments in which he compared them to terrorists. Unionists surrounded the Wisconsin State Capitol in Madison, in the week's third and biggest demonstration against the right-to-work legislation, which would make it illegal for private company trade unions to demand collective dues from employees who are not trade union members themselves. After an eight-hour debate on Wednesday – during which observers were ejected by police – the bill was passed by a narrow margin of 17 to 15. It will now go to the upper chamber next week. The Assembly, which enjoys a wide Republican majority, is expected to rubber-stamp it. It will be enacted as soon as it is signed by Governor and 2016 presidential hopeful Scott Walker. Wisconsin would then become the 25th US state to a adopt right-to-work law. Walker – a renowned anti-union politician – made a gaffe earlier this week. He tried to bolster his future credentials as a US president who can tackle international terrorism, by comparing fighting the Islamic State (ISIS) with his handling of the massive Act 10 protests in Wisconsin four years ago. “I want a commander in chief who will do everything in their power to ensure that the threat from radical Islamic terrorists does not wash up on American soil. If I can take on 100,000 protesters, I can do the same across the world,” Walker told CPAC, a group of influential Republican donors, on Thursday in Maryland. After being roundly criticized for the comments, Walker tried to backtrack, and denied that he was making a direct comparison. Act 10 – which reduced state workers’ bargaining power and led to union membership falling by one-fifth to around 11.7 percent – has sapped the morale of union workers. Meanwhile, the new legislation would likely result in further union membership numbers, a fall in fees – from both members and non-members – and likely less bargaining power for workers. The governor insists that any losses will be offset by additional revenues from companies drawn to Wisconsin by the business-friendly legislation.